The past 2 weeks have been all about reflection on who we are -- both as individuals as well as a people. The upcoming WhyNot? 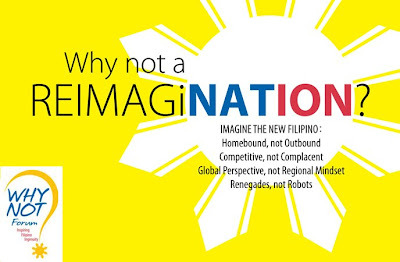 gathering on Aug 22 tackles the very timely subject: Why Not A ReimagiNATION? August 22, 3pm to 6pm @ the Ayala Museum. Tickets at P200 each. Please email whynotforum@gmail.com for reservations. Are you aged between 18-24 years of age and a young Filipino leader wanting to be part of an effective and lasting solution? Rise above the apathy and feeling of helplessness! The Asian Institute of Management is responding to the "need to develop a new breed of young Philippine leaders, who will have the will, skills, and support to take up the great challenges that the Philippines confronts." 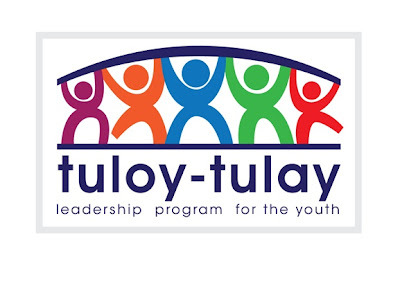 The Tuloy-Tulay (Building Bridges) Leadership Camp for the Youth is an intense and challenging week of personal discovery, skills enhancement, and commitment building. One of the Camp’s core messages is that given the complex problems that are faced in the country, no singular leader can address these alone. There is a great need to learn how to work together. 2. Facilitating the building of a vibrant network among the participants, who will have an intense shared experience through the Camp, so that knowledge and resources can be shared in an effort to continually improve and sustain each other’s leadership and efforts. Do apply online by clicking http://www.tuloytulay.aim.edu.ph/. Application is on-going until August 28. (please feel free to repost this message and link-up in your blogs).